Hillside Leisure is a going-places motorhome converter based near Derby. 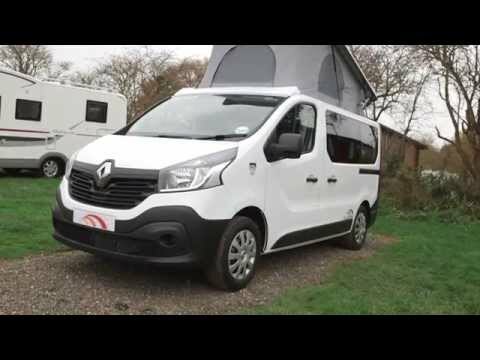 Brothers Mark and Adrian Cross helm a company renowned for high-quality conversions of smaller base vehicles, including the VW T5 and Renault Trafic. The firm created a buzz at last autumn's NEC show by unveiling a two-berth microcamper based on the Nissan e-NV200, just a few months after its first conversion on the diesel-powered Nissan NV200. The Dalbury E was the world’s first electrically powered motorhome to go into production – a fine achievement for Hillside and for the UK motorhome industry. Hillside’s T5 conversions go head-to-head with the likes of Bilbo’s – and Wellhouse Leisure, whose Hyundai i800 and Ford Transit Custom base vehicles offer viable alternatives to the hard-to-avoid VW. Hillside’s Ellastone does the same on the Renault Trafic. Buyers get a camper that’s a similar size but for a lower outlay. The Ellastone is based on the Trafic Business, which features an uprated spec for those who use the vehicle as a mobile office – DAB radio, Bluetooth and USB connectivity all feature as standard. The current third-generation Renault Trafic was introduced in 2014, so it’s about as new a base vehicle as you can get. Driver aids include ESC and hill start assist. The Trafic’s grille and automotive headlight clusters make the front end look like it’s smiling at you. Fuel economy should help you maintain a happy outlook, too. Official figures claim 43.5mpg, courtesy of a 1.6-litre unit producing 90bhp. Small enough for the school or supermarket run, the Ellastone is therefore a genuine daily drive. So if you’re not badge-centric, are shopping on a budget but insist on quality, then Ellastone could be one Derbyshire village to visit. Hillside retains the structural integrity of the base vehicle, except to cut into the top to fit the elevating roof. The version with a nearside sliding door is sourced specifically for the UK market; subtle ‘Hillside’ logos are placed around the vehicle, on the side and rear panels, and on the front wings. Our test ’van was finished in Glacier White, but nine other colours are available, and Hillside will offer all of them. Inside, the Ellastone follows the familiar layout of a rear seat bench adjacent to an offside kitchen. An occasional table can easily be added in front of the rear seats to create a lounge that seats three people when the front passenger seat is spun to face backwards. The Ellastone’s galley comprises a 50-litre compressor fridge just below a gas-powered grill. Cleverly, the fridge and oven are hidden behind a hinged storage unit that is secured with a latch. This makes up for having no head-height kitchen lockers and is big enough for stowing a decent amount of provisions. Two other cupboards are available, to the right of the fridge, and cutlery storage is concealed under a flush-fitting flap on the right-hand side of the kitchen worktop. To its left is a rectangular sink with a mixer tap, adjacent to two gas burners, all with opaque hinged lids to provide extra space for food preparation. At night, the rear seats convert into a spacious lie-flat double bed that measures 1.9m x 1.22m (6ft 2in x 4ft 1in). The process follows the standard rock’n’roll bed deployment, and is achievable in a matter of seconds. A further two berths, measuring 2m x 1.23m (6ft 6in x 3ft 11in), are available in the elevating roof; these have Froli springs for maximum comfort. Like most campervans of a similar size and layout, there’s no space for a washroom on board the Ellastone, although there is a Porta Potti, which tucks away discreetly under the rear seats. You also get an underslung water tank and electric water heater, plus an ‘activity shower’ attachment for hosing dogs and wellies down outside the vehicle. Storage in the Ellastone is available in various nooks and crannies, in addition to that offered by the kitchen. Space under the rear seat bench is accessible from both sides. Another cupboard under the cutlery storage houses the fuse box and MCU, with a wardrobe behind the rear seats and above the gas locker. Storage space is also available between the bench seat and the rear barn doors. Standard equipment includes LED lighting, an 85Ah leisure battery with split charging and an external hook-up point. Heating is provided by an Eberspächer diesel blown-air system. Riding on an affordable alternative base vehicle to the VW T5, the Ellastone packs a lot in for a modest price. It’s a fun daily drive and well equipped for the touring lifestyle.